Some time back I wrote a post about how you could move the ebooks you bought at Borders over to Kobo. I said at the time that Borders had gotten out of the ebook business. Well, today I got an email which shows that Borders aren't just trying to encourage customers to switch over, they're shoving us out the door. Make the Move Now... Move Your eBooks to a Kobo Library! That was the subject line of the email, and the only topic discussed in the email was why I should move my account over to Kobo. But it gets better. If you move your ebooks over, Borders will enter you in a contest to win a $500 Kobo gift card. They're raffling off a total of 10 cards. Yes, Borders are so eager to get people to move over that they are giving away $5k. That's not a huge amount of money when compared to how many customers they probably have, but it does feel like they're in a hurry. I'm guessing that this is a time sensitive issue, and that's why they're shelling out the money. So what is coming that would make Kobo and/or Borders push for this? That, my dear, is the million dollar question. This email came just over a week after Borders announced that they had a buyer. The Najafi-Borders deal is supposed to wrap up by the end of July, and I can see that everyone would want to have all the ebook customers off of Borders servers by then. But why? If Borders were going to be a long term partner, this wouldn't matter so much. The way that they're pushing the changeover would suggest that the 2 companies might part ways. I won't take a guess at the odds of that happening, but I do think there's a chance. In fact, if you look at the Android that have switched from the Borders app to the Kobo app (E-Fun, Velocity Micro), it begins to feel like a certainty. I wouldn’t think this means that they are parting ways. Since Borders has a 25% stake in Kobo, the more people buying Kobo books, the more maney they can make. Also, since the Border e bookstore was really the Kobo bookstore underneath, this saves overhead of not having to run two bookstores when they can run one. Several stories say that Borders share of Kobo is “around 20%”, so it’s not clear how much they own. But how do you know that Borders will still own part of Kobo? They could be looking to sell it off. It might already be in process. Plus, why settle for a share of Kobo’s US profits when you can have 100% of what you earn yourself? Kobo stake or not, the handwriting has been on the wall for a while. 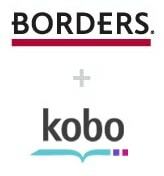 Borders is sweeping out the remnants of the Borders/Kobo ebook deal because the New Borders will need its own independent ebook operation if it is to have any long term growth prospects. Best guess is they want to remove all Kobo-related obligations so they can sell the stake and launch their new venture as soon as the deal clears so they can get in position to exploit the holiday season sales spike. Looking at the kinds of deals the Najafis have been doing, they clearly intend a strong digital media play spearheaded by ebooks. I expect a pair of Borders-specific gadgets—one eink, one lcd—tied to a new online storefront carying books, music, video, and games. Probably rebranded generics; no shortage of those available. With Bluefire running a one-stop shop for client apps and back-end services they would be the likely suspects to replace Kobo. Kobo is not yet profitable so how much could their 20% stake be worth? Borders may also have found another company offering better terms. They may have persuaded the bankruptcy judge to end their contract with Kobo.